In a new study that sheds light on space weather's impact on Earth, Dartmouth researchers and their colleagues show for the first time that plasma waves buffeting the planet's radiation belts are responsible for scattering charged particles into the atmosphere. The study is the most detailed analysis so far of the link between these waves and the fallout of electrons from the planet's radiation belts. The belts are impacted by fluctuations in "space weather" caused by solar activity that can disrupt GPS satellites, communication systems, power grids and manned space exploration. The results appear in the journal Geophysical Research Letters. The Dartmouth space physicists are part of a NASA-sponsored team that studies the Van Allen radiation belts, which are donut-shaped belts of charged particles held in place by the Earth's magnetosphere, the magnetic field surrounding our planet. In a quest to better predict space weather, the Dartmouth researchers study the radiation belts from above and below in complementary approaches - through satellites (the twin NASA Van Allen Probes) high over the Earth and through dozens of instrument-laden balloons (BARREL, or Balloon Array for Radiation belt Relativistic Electron Losses) at lower altitudes to assess the particles that rain down. The Van Allen Probes measure particle, electric and magnetic fields, or basically everything in the radiation belt environment, including the electrons, which descend following the Earth's magnetic field lines that converge at the poles. This is why the balloons are launched from Antarctica, where some of the best observations can be made. As the falling electrons collide with the atmosphere, they produce X-rays and that is what the balloon instruments are actually recording. 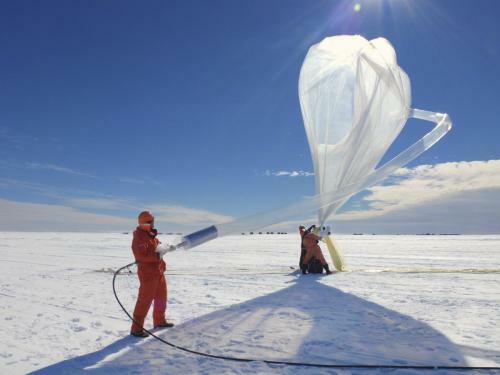 "We are measuring those atmospheric losses and trying to understand how the particles are getting kicked into the atmosphere," says co-author Robyn Millan, an associate professor in Dartmouth's Department of Physics and Astronomy and the principal investigator of BARREL. "Our main focus has been really on the processes that are occurring out in space. Particles in the Van Allen belts never reach the ground, so they don't constitute a health threat. Even the X-rays get absorbed, which is why we have to go to balloon altitudes to see them." In their new study, the BARREL researchers' major objective was to obtain simultaneous measurements of the scattered particles and of ionoized gas called plasma out in space near the Earth's equator. They were particularly interested in simultaneous measurements of a particular kind of plasma wave called electromagnetic ion cyclotron waves and whether these waves were responsible for scattering the particles, which has been an open question for years. The researchers obtained measurements in Antarctica in 2013 when the balloons and both the Geostationary Operational Environmental Satellite (GOES) and Van Allen Probe satellites were near the same magnetic field line. They put the satellite data into their model that tests the wave-particle interaction theory, and the results suggest the wave scattering was the cause of the particle fallout. "This is the first real quantitative test of the theory," Millan says.